In the picturesque, coastal town of Bayou La Siryna, Alabama, a family of shapeshifter mermaids lives unknown among the ordinary townspeople. Although a full mermaid, Jet Bosarge finds less acceptance among her kind than her cousin, who is a TRAB, a half-human traitor baby. Jet can’t understand why the other merfolk keep their distance from her, but she believes it is related to her looks. Tall, athletic and muscular, with dark eyes and hair, she can outswim most of the mermen at the annual Poseidon games, but no one seems impressed. They are much more enthralled with her elegant sister, who wins the siren song contest every year with her exquisite voice. All Jet longs for is a loving family of her own, but she doubts it will ever happen. Three years ago when Chilean police raided their salvage operation, her human ex-boyfriend betrayed her. He blamed their illegal activities on her and even spilled the secret of her nature. Luckily, no one believed him. Jet jumped overboard and got away, but her ex was arrested. Since then, she hasn’t trusted humans and wouldn’t think of revealing her true self to a dirt dweller. Landry Fields is an FBI agent, undercover as an IRS auditor, investigating Jet’s ex, who recently received an early release from prison. Landry suspects the guy is plotting criminal activity and he thinks Jet may be involved as well. He contacts Jet in the guise of looking into her finances, but really intends to find out what the ex is up to. Landry had a rough childhood after his father left and his mother had a string of husbands who left behind a number of half-siblings, causing the family to live from hand to mouth. As the oldest, Landry had to look out for all the others. The only good part of his youth was visiting his Mimi in Bayou La Siryna every summer. When she passed away several years ago, he inherited her house. He visits the town whenever work allows. Since his fiancée left him for someone else, he doesn’t believe in loving or trusting anyone. He relies on himself and likes it that way. When Jet and Landry meet, the attraction between them is instant and electric. However, Jet can’t let Landry find out too much about her business with her ex, or he might figure out it is her mermaid abilities which help her find undersea treasure. She’s also worried about him pressing charges against her for questionable business practices her ex entangled her in. Landry has his own secrets, including his real purpose for coming to town. Both have been burned and are wary. When Jet’s ex won’t take no for an answer to one last venture and the crime boss behind the project gets tired of waiting for her help, Jet faces the most dangerous situation of her life. To survive, she must face her greatest fear. As danger mounts, Landry must let down his defenses and open himself to the possibility of love and magic, or he will lose the woman he has come to cherish above his own life. 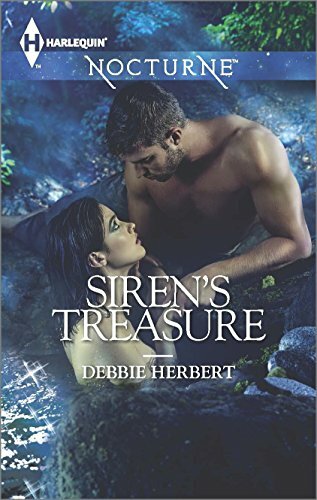 I was spellbound by Siren’s Treasure. The compelling characters, suspenseful plot and tightly written story hooked me from beginning to end. I read it twice because I enjoyed it so much. This book could be read as a stand-alone, but I highly recommend readers start with Siren’s Secret, which is the story of Jet’s cousin, Shelly. After Siren’s Secret and Siren’s Treasure, you won’t be able to resist the third book in the series, Siren’s Call. I guarantee it!